a few self-timer shots later ... LOL .. i know this is lame but hey i didnt have a casket to stage my first idea of the funeral guy in. FYI - No need for the lengthy title. Should have the date on the lottery ticket, instead of the "10,000,000 Winning Ticket". It's an off balance shot (much more white) with the only real element of contrast being the soap dish. Overall, I think it's a 3. Better placement and cropping would have yeilded you a higher score. 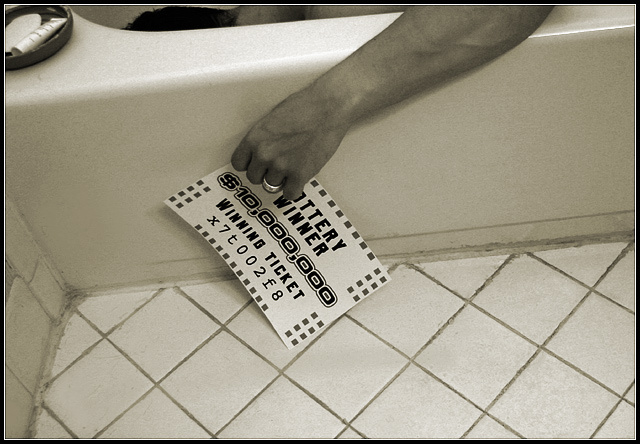 The position of his arm doesn't look natural, it isn't believable that he is suppose to be dead (which I assume is what you are trying to convey) Maybe him laying in the tub with the ticket lying next to it would have been more effective,. good effort. I would make one suggestion to show more of the upper torso of the main subject and straighten the shot a little. Just a thought. Nice work. Good angle, lighting is ok.
A good idea. Very ironic. the composition feels awkward to me. I'd like to crop at the left and get to see more of what is above the top edge. It would help the viewer follow the idea of the picute better. Perhaps a little more light at a different angle too? heh. was he 98? I'd like it slightly more if the composition was more...straight I think. ie. the line of bathtub and tiles formed a stright line and the curve of the inner bath was not there at the top. that's just me. Not a bad idea - it would be ironic. total alanis, but the photo quality is and tones are good. How morbid! Good idea though. I love the sepia toning. Proudly hosted by Sargasso Networks. Current Server Time: 04/19/2019 04:17:52 PM EDT.